This project is, without a doubt, one of the most wonderful residential projects in my career. When "Home & Garden Television" recently featured my work, this is the house I selected to illustrate what I was working on. The owners Steve Pearson and Lynne Pszcola have a passion for the Arts and Crafts movement. They assembled an incredible team of Architect Christopher Secor, Interior Designer Lou Ann Bauer, Contractor Paul Farinato, as well as numerous dedicated artisans and craftsmen, in wood, metal, tile, and stone, to carry out the plans. I was honored to be selected to create the leaded glass as part of this team. 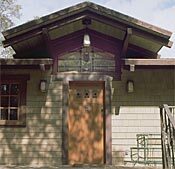 Mr. Pearson had purchased an old Craftsman style home that had undergone several restorations and additions. 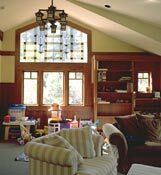 This project called for taking what was there, tearing some of the building down and adding elements, to bring it all back to the look of an authentic Arts and Crafts Home, but with modern conveniences. There was also the addition of a Carriage House that attaches to the main house as well as extensive decks, railings, stone walls all around, a well planned and executed ensemble. Everything was done to make the building look like it was a vintage historic building, down to researching the correct stains and using restoration hardware. Mr. Pearson is an aficionado of Greene and Greene's historic Southern California architecture as well as architect Frank lloyd Wright's work. He has collected period furnishings as well as light fixtures and hardware that were all built into the project. The result was a home that looked like it was all built at the same time, rather than additions and restoration. Chris Secor, the architect, did a fabulous job in planning. Here was a client with the same passions and inspiration that my work has evolved from. 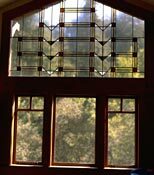 We went through numerous art glass designs and revisions to get everything the client wanted designed into the leaded glass. The extensive, multi-year project included numerous doors and windows, used in ensemble thruout the home. The Entrance Foyer included a door with glass, as well as windows all around the space. Other areas in the main house receiving glass detailing included the Kitchen, a wonderful stair landing grouping incorporating a window seat, a large window up in the eaves of the Family Room, several Bathrooms, a Sleeping Porch above the Entrance, as well as a very intricate Wright inspired panel in Mr. Pearson's office. The Carriage House added another Entrance Door with transom, as well as a pair of large windows up in the eaves on either side of the addition. The glass designs, inspired by Prairie School art glass, used the themes and colors started in the Entrance and evolved them into unique variations all around the home. The glass is really one of the features used to unify the project. What a masterwork!